Russia's Pancake Week, begins in Russia on Mar. 11 this year. People are preparing for the arrival of spring by gathering with relatives to eat pancakes. 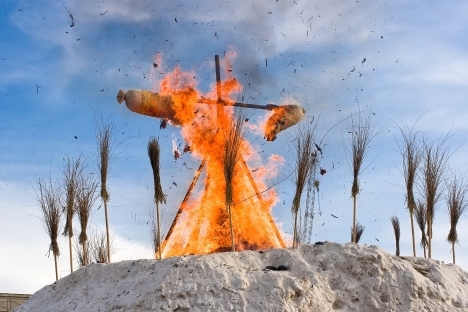 Typically, Maslenitsa is celebrated with sledding, burning scarecrows, and bonfire jumping. “Maslenitsa” — a holiday vaguely similar to Pancake Day in the UK — is an ancient Slavic holiday that dates back to pagan times, having somehow survived the onset of Christianity. The Church incorporated the spring holiday into its cycle of religious observances, placing it on the Shrove Tuesday before the start of Lent. This year, the week of Maslenitsa begins on Mar. 11. Some people say the name Maslenitsa (variously translated as “Butter Week,” “Cheese Week,” or “Pancake Week” in English) comes from the fact that, according to Russian Orthodox tradition, meat is already off-limits by Shrovetide week, but dairy is not. Maslenitsa is the richest and merriest of Russia’s festivities. It runs for a whole week. Rural folk used to call the holiday “sugar lips,” “kissy week,” “merrymaking,” and even “pig-out week.” One essential part of the merrymaking was horseback riding — and, of course, the horses donned their finest festive trimmings. Young bachelors who hoped to wed would get hold of special sleighs, and every young couple took part in the tradition. Downhill sledding was also very popular amongst children, as were jumping hand-in-hand over bonfires and besieging ice forts. In the 18th and 19th centuries, the central event of the Maslenitsa festivities would have been Mummers Plays, with villagers playing symbolic characters such as “Maslenitsa,” “The Voivode” (“The Warlord”), and so on. Usually, the storyline was that of the holiday itself — people gorging themselves ahead of Lent, along with farewells and promises to come back next year. This kind of play would sometimes include actual local events, as well. Throughout the years, Maslenitsa always clung to its roots as a folk festival: all of its events are in some way related to the idea of driving away the winter and re-awakening nature from its slumber. Maslenitsa was celebrated with magnificent singing on the snowy hills. The symbol of Maslenitsa was always a scarecrow, decked out in women’s clothes and paraded around before being burned on the bonfire — along with the pancake in its hand. Pancakes are the principle dish and symbol of the festival. They are made every day during the week, starting Monday, but most of all from Thursday to Sunday. Pancake-making is a pagan tradition that goes way back in Russian history. It is the pagan sun god “Yarilo” who banishes the winter darkness, and the round golden pancake is meant to represent the sun. Housewives jealously guarded their own special pancake recipes and handed them down to their daughters, from one generation to the next. People would make them from wheat flour, buckwheat, oats or cornmeal, sometimes adding wheat or millet porridge, mashed potato, pumpkin, apples or cream as fillings. An old custom in Russia declares that the first pancake of the batch symbolizes peace; usually the first pancake was be given to a beggar in remembrance of the dead, or simply put out on the window ledge. People ate their pancakes with sour cream, eggs, caviar and other tasty dressings, gobbling them down from noon until night, in between other tasty delights. The festive week was often called “the pure, the broad, the quaint,” as well as “Madam Maslenitsa” or “Lady Maslenitsa.” Even now, each day of the holiday has its own special name, hinting at the customary festivity for that day. Maslenitsa Monday is the day for greeting the holiday. Snow-slides should be laid out and built. Kids would make the Maslenitsa scarecrows, dress them up, and parade them through the streets. Swings were set up, along with tables full of sweets. Tuesday is the start of the merriment! Young men and women would go downhill sledding before having their pancakes. Young men would be on the lookout for a future bride, while girls would scope out the selection of prospective husbands. Even if a match was made, the happy couple had to wait until after Easter to marry. Wednesday is the day for those with a sweet tooth. The emphasis was on entertaining guests — with pancakes, of course! Sons-in-law visit their mothers in law, who make pancakes. Thursday is the day for going out. In order to help the sun drive winter away, people would ride horseback “around the sun” — that is, around the whole village in a clockwise direction. The main attraction for the village lads on Thursday would be splitting into two teams — to defend, or besiege — the ice fort. On Friday mothers-in-law visit their sons-in-law for pancakes. Saturday is the day for family gatherings. Villagers would make the round of visits to all their relatives and, of course, eat pancakes with them. Sunday — the final day of Maslenitsa — is the day for forgiving. On this day, people would ask forgiveness from their nearest and dearest for any sleights or grievances that might have happened over the year. Then, of course, there was singing and dancing. There would be a village bonfire, on which the scarecrow was be burned in a ritual to see off the winter. The bonfire would be in the village square, and the scarecrow would be carried off with jokes, songs and dances. Winter was mocked and derided for bringing the frost, but thanked for the winter fun and games. Once the scarecrow caught light, a sequence of happy songs and chants would begin. Once “winter” burned out, the final round of hijinks began: youngsters and young couples would jump over the bonfire, and their display of ability would thus bring the Butter Week festivities to a close. Maslenitsa’s end is marked on “Clean Monday,” the first day of Lent — a day to cleanse oneself of impure thoughts and unapproved foodstuffs. Villagers would ritually cleanse themselves by going to the Russian bath houses (“banya” in Russian). Womenfolk would wash all the household paraphernalia, and “steamed” the dairy utensils to remove any traces of foods forbidden during Lent.